PENCILLERS: Carmine Di Giandomenico, Neil Googe, Felipe Watanabe. Cover by Karl Kerschl. Barry Allen got his powers from a bolt of lightning, and the Speed Force has always been somewhat electric in nature. So it’s natural that at certain points the Flash crackles with energy. But that doesn’t mean he should constantly look like a lightning rod in a storm. But that’s how our main artist draws him in this first volume of The Flash under the DC Rebirth banner. At certain points it’s cool, but it eventually becomes a distraction that drags the entire book down. Which is a shame. From a story standpoint, Lightning Strikes Twice is pretty good. We open the book with the events of DC Universe: Rebirth #1, this time seen from Barry’s point of view. A short time later, numerous citizens of Central City are struck by lightning bolts just like Barry was, and are imbued with the power of the Speed Force. Now our hero must not only mentor those who would use their powers for good, but corral those who abuse them. All the while, a mysterious killer calling himself Godspeed is killing off these new speedsters. Thankfully he’ll have help from not only Iris West, but a young man who’ll soon call himself the new Kid Flash. I like the idea of Barry being a teacher or a mentor. It’s almost part and parcel to the superhero concept. Sidekicks, inspiring people to do good, etc. First he finds a new partner in fellow scientist August Heart. Then the Speed Force lightning storm gives him several new trainees. Of course, it all culminates in Wally West becoming the new Kid Flash. 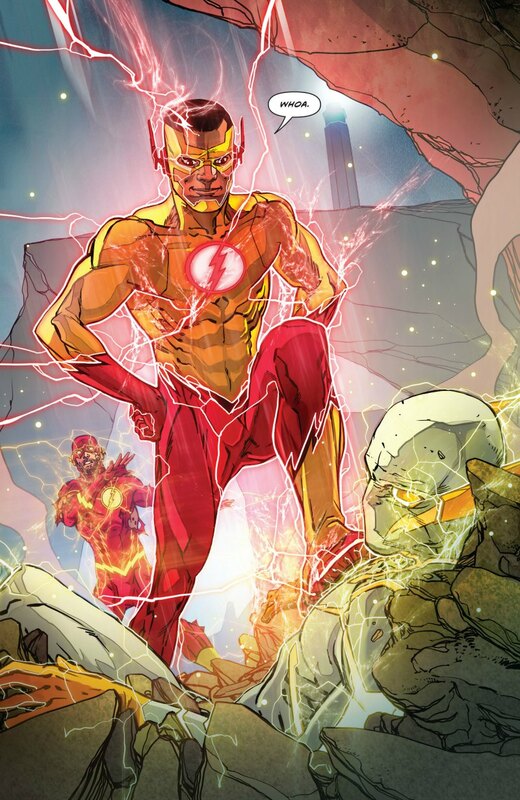 (That’s the New 52 Wally West, not the pre-Crisis one that just came back. Thank God that’s not confusing.) It all ties nicely together with the original Wally West’s return, and it’s cool to see the gratification Barry gets from it. I can appreciate that when he got his powers, young Wally wasn’t immediately thrust into the Kid Flash role. We all knew that’s where he’d end up anyway. But Williamson does a fine job taking him from a kid who’s content to sit on the sidelines and help out occasionally, to a hero who realizes he can’t be on the sidelines. It gives him that much more depth. As for the other Wally, the first issue in this collection, The Flash: Rebirth #1, gives us a little bit of follow up on the events of DC Universe: Rebirth #1. The reunion continues, as Wally tells Barry about Linda Park, and we see how they part ways. We also get a very brief corroboration between the Flash and Batman. But that plot thread is mostly dropped for the remainder of the book. It’s obviously a larger story for down the road. We do, however, get a very interesting reference to what happened to Barry in Crisis on Infinite Earths. That’s obviously out-of-sync with what they set up in the New 52. It’s a little reminder that they haven’t dropped that story. It’s just a slow build. On paper, the identity of Godspeed shouldn’t be hard to figure out. But I’ll admit: They got me. The character’s motivations are believable, and they spend a good amount of time building them up. Godspeed represents Flash’s darker impulses. The ones he doesn’t allow himself to follow. The character asks some classic questions about why those impulses shouldn’t be followed. 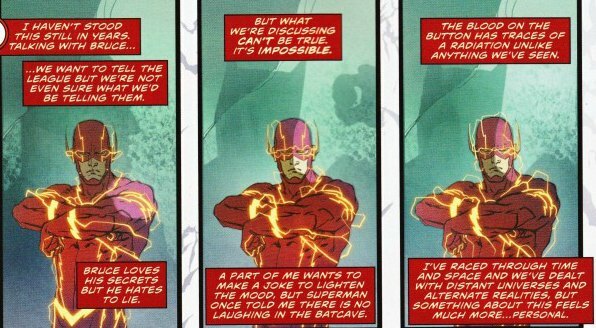 It more or less boils down to “Why doesn’t Batman just kill the Joker?” Or in this case, why doesn’t Barry just kill Zoom? They leave the door open for him to come back, and there’s potential for some more interesting stuff with him. 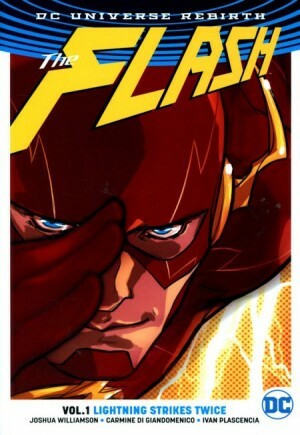 I’ve avoided picking up The Flash on a monthly basis, largely because of Di Giandomenico. The whole lightning thing aside, he knows how to convey the speed and energy of a character like the Flash. The characters hit most of the right emotional notes, and I’m into the story. But the line work is so dark and heavy that it ends up weighing down the impact of the art. It’s almost like you have to look through all the senewy lines to register what’s going on. When Neil Googe tags in for issue #4, and Felipe Watanabe for issue #5, it’s a welcome break. With the CW TV series still going strong, Wally West’s return, and Barry being linked to what’s sure to be DC’s next big event comic, It’s a pretty good time to be a Flash fan. If we could find an artist that fit the book a little better, it’d be downright amazing. But for now, we’ll have to settle for pretty good. This entry was posted in Comic Books/Graphic Novels and tagged Barry Allen, Carmine Di Giandomencio, Carmine Infantino, comic book reviews, DC Universe, DC Universe Rebirth, DC Universe: Rebirth #1, Felipe Watanabe, graphic novel reviews, graphic novels, Iris West, Ivan Plascencia, Joshua Williamson, Karl Kerschl, Kid Flash, Rob Siebert, S.T.A.R. Labs, Speed Force, superhero comics, superheroes, The Flash, The Flash costume, The Flash Vol. 1: Lightning Strikes Twice, Wally West on 02/13/2017 by primaryignition.